New research suggests some asteroids started as giant mud balls. 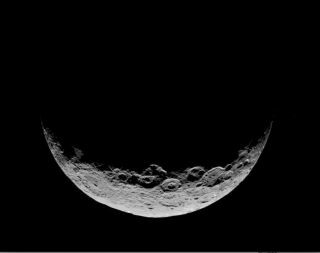 The largest objects in the Asteroid Belt, like Ceres (shown here), might still harbor mud at their hearts. The most common asteroids in the solar system may have started out as giant balls of mud, rather than as rocks, as scientists previously thought, a new study finds. Such mud balls could still exist today in the heart of the largest asteroids, according to the study. One key reason scientists investigate carbonaceous asteroids is that they were probably the building blocks of the rocky planets of the solar system, said study lead author Philip Bland, a planetary scientist at the Curtin University of Technology in Australia. Analyzing these giant rocks could shed light on the origins of Earth, Mars and the other terrestrial planets. However, the way carbonaceous asteroids formed in the early days of the solar system is still mysterious. "There have probably been about a dozen different models to explain the origins of these primitive objects over the years, and they've all been limited in one way or another," Bland told Space.com. Researchers have observed carbonaceous asteroids and analyzed meteorites thought to come from them to glean details about their composition. However, scientists had trouble devising a model that could explain all of these features of the asteroids, Bland said. "For instance, one model might find there is a lot of water getting circulated around inside the asteroids, so they could lose heat — which would explain why meteorites from these asteroids appear to have experienced alterations at relatively low temperatures," Bland said. "However, if you have a lot of water circulating inside asteroids, it would strip elements from the rock, and you would get a very different chemical composition than what we see in the meteorites." "If there wasn't water inside the asteroids, you wouldn't mess up the chemistry we see, but the asteroids would not lose heat as easily," Bland added. "One way around that is to have the asteroids be smaller so they would cool down more easily, but we don't see that today." All of these previous models assumed the asteroids had lithified — that is, had become rock. "Most people look at meteorites, and they're rocks. So the natural thing to assume would be that the asteroids they came from were rocks, too," Bland said. "We were interested in seeing what happened if we deleted that assumption." Prior work suggested that carbonaceous asteroids formed from round, porous mineral pellets known as chondrules, as well as fine-grained dust, and ice. When pockets of these materials got pulled together by their own gravity, they would not have become rock, the researchers suggested. Instead, when radioactive materials inside the dust and chondrules melted the ice, the result would have been a sludgy mud, they said. "When you stop to think about it, there's no reason that asteroids would be rocks right at the beginning," Bland said. The scientists devised computer models that simulated how pockets of dust, chondrules and ice might act with different concentrations of these various ingredients and the density at which these materials were packed together. They found that not only could asteroids emerge from these building blocks without lithification, but the way in which mud churned in these mud balls could help explain the chemical and thermal details seen from carbonaceous asteroids. "I feel like this helps plug a gap in knowledge when it comes to the question of what happened inside what are amongst the most important objects in the history of our solar system," Bland said. After the mud balls formed, they could have lithified in various ways. For instance, if these mud balls hit each other, the force of the impacts would have generated heat that could have welded the components of these mud balls together into rock, Bland said. As for whether the mud balls might still exist in the solar system, when the researchers modeled Ceres, the largest asteroid, they "found there was a reasonable chance of temperatures above freezing in its interior, so there could still be quite a bit of a mud ball inside Ceres," Bland said. Future research could explore how the other kinds of asteroids in the solar system were born, and how asteroids in other star systems might arise and, in turn, influence the formation of alien planets, Bland said. Bland and his colleague Bryan Travis at the Planetary Science Institute in Tucson, Arizona, detailed their findings online July 14 in the journal Science Advances. Follow Charles Q. Choi on Twitter@cqchoi. Follow us @Spacedotcom, Facebook and Google+. Original article on Space.com.